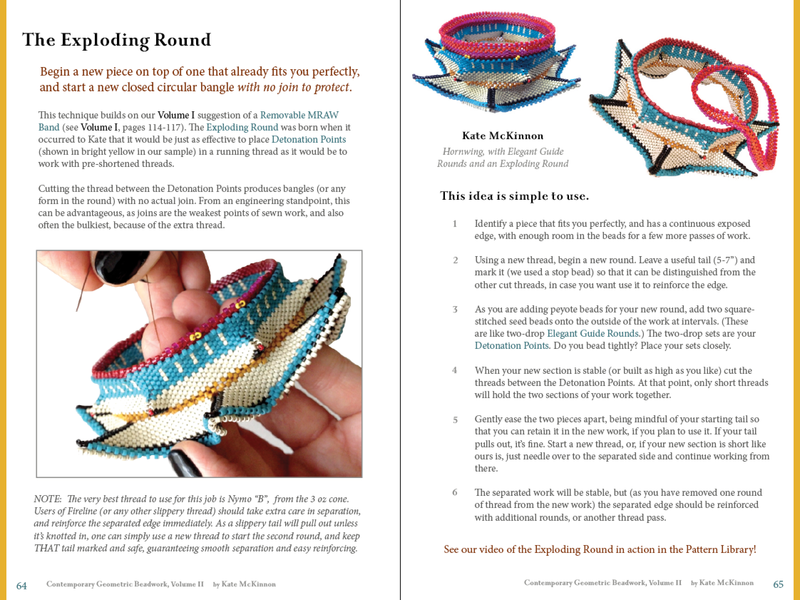 This beautiful technique from Contemporary Geometric Beadwork (Volume II, pages 64-65, Basics Section) might blow your mind, it’s so simple. If you are making a new peyote or MRAW Band start for every geometric or architectural piece you begin, try this instead. 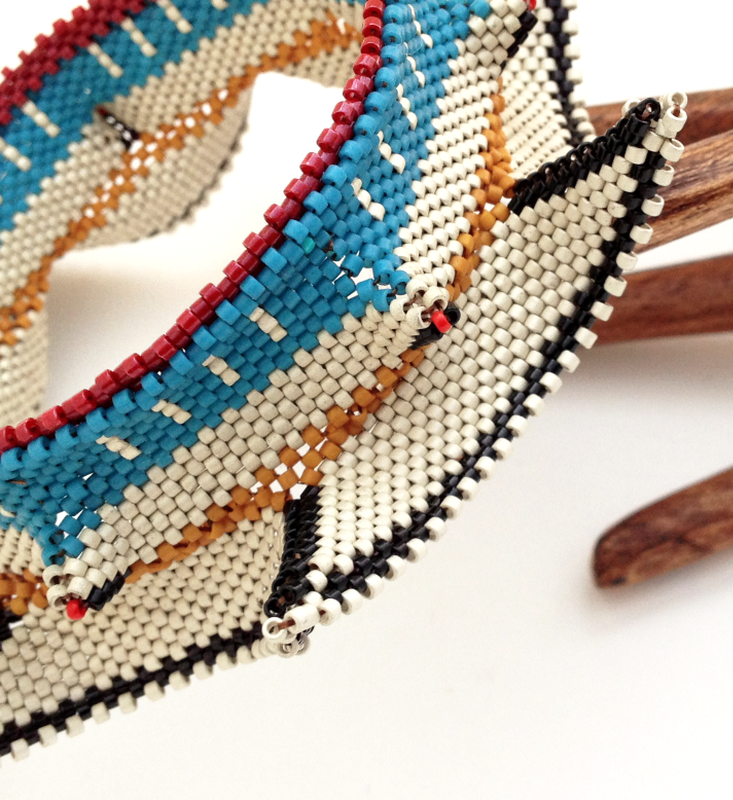 Choose a piece that fits you well in the same style (Zigged Band, Winged Bangle, etc.) as the new piece you want to create. If the host piece is in progress, finish a round neatly, and weave in your thread ends well. The pink round will be begun on top of the red Underskirt from this demo bangle. Begin a new thread (but don’t knot it or weave it in very far) and start a new round. Every inch or so (more frequently if you bead very tightly, less if you bead softly) pick up two round beads of any size (11 is good) and square stitch them to the bead that you just passed through with a peyote stitch. These sets of two beads are your Detonation Points (DPs). Place them well, and ignore them completely. DPs are placed only in the first round of the new piece. Detonation Points (DPs) are square-stitched onto the previous round using round beads. Mine are yellow. 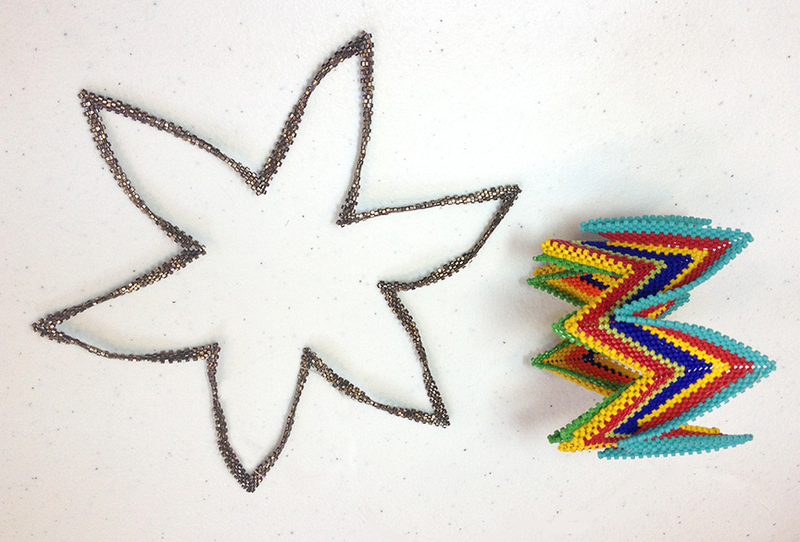 Continue adding rows or rounds of beadwork until you have enough to hold form. This will be between 4-10 rounds, depending on your form. Feel free to add more. You can finish your piece on the host, if it’s convenient. The more developed it is, the easier it will be to remove. When you are ready to separate your new piece from the host, simply cut the threads between the sets of Detonation Points that were square-stitched onto the first new round. If your placement was perfect, the new piece will practically fall off of the host. If your DPs were a little too far apart, or if your beading is very tight, you might have to pry the new layer off. Avoid the latter by putting in enough DPs, and using a soft hand. 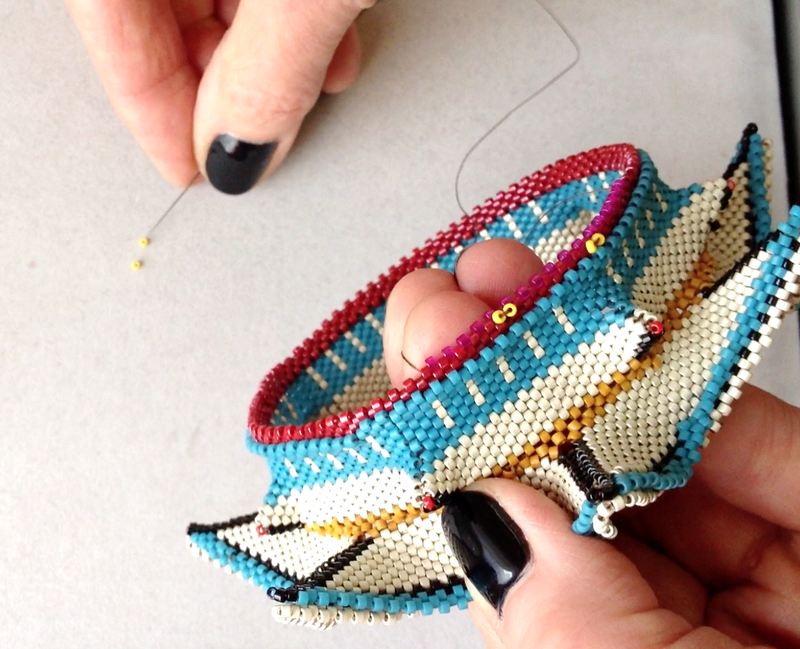 Bear in mind that the first beads added will only have a little bit of thread through them, and that because you removed one round of thread by clipping it out, your separation edge will need reinforcing. The easiest way to do this is to add a round or two to that edge, using a new thread that is well-anchored in the work. 1. Although your first instinct may be to start a second new thread after the first round, it is honestly not necessary. Adding a few rounds to the separation edge will be all of the help that edge needs to be a normal round. If you are in disbelief about this, just watch the video. You can see my original tail, plenty to protect the working edge of the separated beadwork. 2. If you want your new piece to have an MRAW Band, but want the convenience of the Exploding Round start, it’s easy to arrange. Just add a regular RAW round to the new piece after a round or two of peyote has gone in, and there you are – with no join! Think about that for a while. No join to protect. What a structure…. 3. You can start bangles off of flat work, and flat work off of bangles. Video of these techniques, and of an Exploding Round off of a Zigged Band, coming soon! Watch this space! 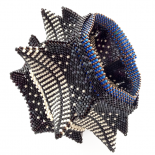 Ida Williams, exploded Zigged peyote start off of a Rick-Rack Bangle. I’m new to this concept and so pardon me if I’m being obtuse but what is the value of exploding rounds? 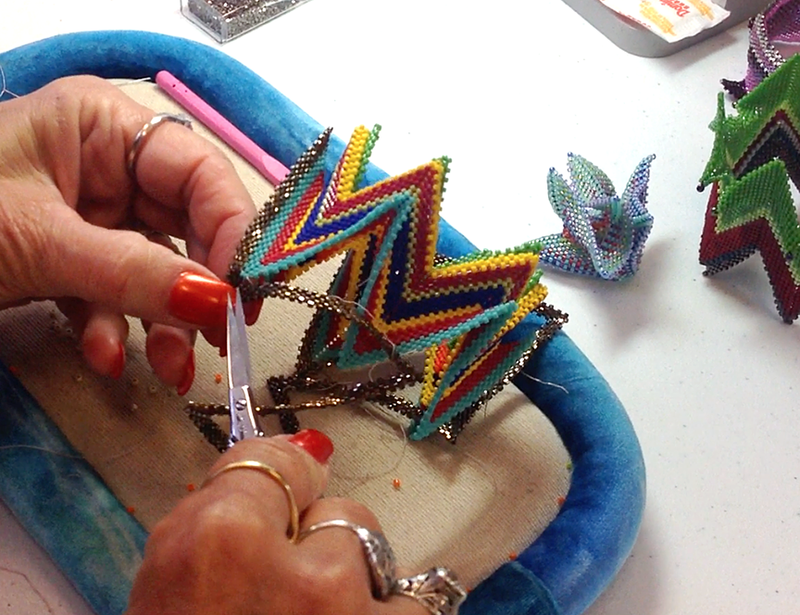 Being able to separate your beadwork into sections, cleanly, has massive implications for new ways of starting pieces. Imagine never having to make a long peyote (or MRAW) start again? Exploring round video is great! I’m interested to know what is the use of the small object next to your scissors that looks like candy on your desk. It’s probably my little Japanese rubber eraser, which I use as a beading tool – if I need to explode a mis-placed bead (instead of crushing it or unbeading until I get to it) I push a thumbtack into the bead and into the eraser (which saves me from getting stabbed.) The bead explodes harmlessly away from the thread. I am really keen to do this from my fortuneteller bangle I just havent gotten around to it yet LOL I also like the idea of using my zigged tulip flower to do another…. Great explanation. Can this be made into PDF format to be added to a beaders library? I’d prefer that you link to the page; my content is kind of alive, and will evolve.